Is Barry McGee A Graffiti Art Sellout? 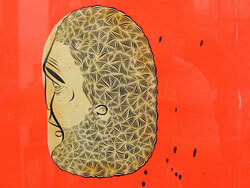 Doug Neill emailed over a few photos from Barry McGee's opening last Friday at Prism in Los Angeles. Shawn Whisenant emailed over a few pics from Saturday's Barry McGee and friends show at Contemporary Arts Centre here in SF. Thanks for the pics, Shawn. Barry Mcgee (right) chatting with an officer about... loud noise? A speeding ticket? Graffiti task force finally catch up to Barry? This just in from Mickey Reyes' Instagram via Paule Anglim. San Francisco CA Gallery Paule Anglim is pleased to announce a special exhibition by Barry McGee at the gallery's off-site space at 1717 17th Street in San Francisco's Potrero Hill district. Contemporary Arts Centre describes the community acknowledging its present and past: an installation featuring work by McGee and fellow invited artists. Moving easily across the boundaries of street art, historical High Art, private/anonymous art practices and museum-sanctioned collections, Barry McGee has created and collaborated on artworks appreciated by a broad audience. Acclaimed for his work as a graffiti artist and for his installations in galleries, museums and art festivals around the world, the artist crafts a language that resonates as a shared public experience as well as on a private intimate scale. Addressing social concerns of urban life, yet elaborating a unique personal style, McGee's works focus on a shared humanity, one painstakingly hand-detailed, finely-painted image at a time. McGee's work has been shown widely in the San Francisco community and internationally, including The Venice Biennale (2001) and the Biennale de Lyon (2009-2010,) the Geffen Contemporary at MOCA Los Angeles, the Walker Art Center in Minneapolis, the UCLA Hammer Museum in Los Angeles, the BALTIC Centre in England and the Watari-um Museum in Tokyo. A retrospective exhibition of his work will be presented at the Berkeley Art Museum opening August 2012.